Looking for dynamic solutions that reward your bottom line? Just-in-Time printing solutions add value to your packaging process. Produce what you need when you need it. Lower unit costs while improving the security of your product. Slash waste and simplify inventory and logistics. Command product quality and production control. Reduce turn-around times. Open markets in new countries, create generic businesses and maximize sales to HMO’s. The world leader of Late Stage Customization and On Demand printing technologies, Hapa delivers the pharmaceutical, medical, food and healthcare industries the most sought-after printing technologies available to meet any Just-in-Time print production need securely and reliably. Based in Switzerland, Hapa is backed by a worldwide network of sales and service centers; and with branches located in the UK, USA, Mexico, Brazil and India, we provide professional, local support engineered to your production and security needs. Hapa offer’s you all of the most sought after Just-in-Time print technologies. 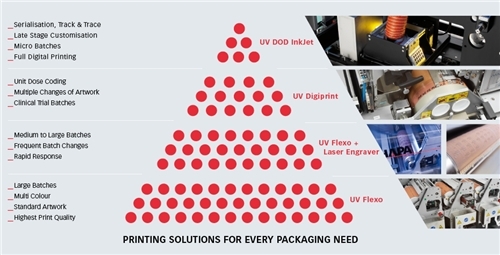 UV Flexo technology is ideal for all bulk printing – runs in the tens or hundreds of thousands – and for product information and artwork requiring the highest print quality. When batch sizes shrink, and runs shorten, in response to market or regulatory demands, digital technology becomes more cost-effective. 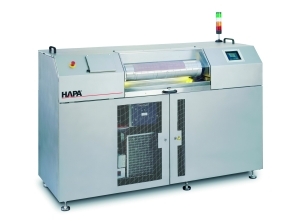 Hapa offers UV Digiprint, the efficient computer-to-print technology for medium-sized batches where more frequent changeovers are required, and UV Drop on Demand, the non-contact, fully-digital print technology, ideally suited for the smallest batches, serialisation and Track & Trace. Featuring state-of-the-art Drop On Demand (DOD) InkJet technology with sophisticated drop placement at up to 720 dpi, HAPA 800 systems deliver unparalleled print quality. Requirements for unit dose coding, sequential and randomised numbering are all easily addressed, thanks to the HAPA 800’s capability to print both artwork and variable data in a single pass. Maximum flexibility in production planning is achieved as a result. All Hapa 800 systems offers fully digital printing of text, barcodes, graphics and images in one to four spot colours or CMYK process printing. Only Hapa offers you all of the printing technologies available to meet any pharmaceutical print production need. UV Flexo technology is ideal for all bulk printing – runs in the tens or hundreds of thousands – and for product information and artwork requiring the highest print quality. When batch sizes shrink, and runs shorten, in response to market or regulatory demands, digital technology becomes more cost-effective. 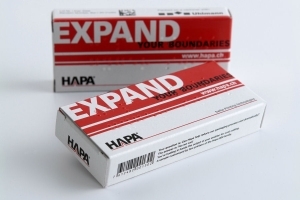 Hapa offers both UV Digiprint, the efficient computer-to-print technology for medium-sized batches where more frequent changeovers are required, and UV DOD InkJet, the non-contact, fully-digital print technology, ideally suited for the smallest batches, serialisation and track and tracing. 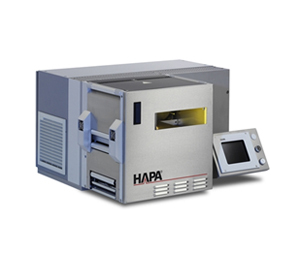 The Hapa 500 series laser engraver incorporates a 50 or 200 Watt CO2 laser, for medium or high speed engraving of Hapa-quality print mat material at up to 2400 dpi. The blank RubberFlex or SiroFlex material, with pre-drilled holes, is attached to the engraving drum using the same simple-to-use pin location system that is used on all Hapa printers. Artwork and variable data are engraved in a single pass. Each print mat is automatically engraved with a “read only” identification number, which can be included on the bill of materials when the mat is signed and released for production. Because the system is digital, variable data such as lot and expiration dates, can be added very easily, eliminating the need for steel coding digits on your packaging line. The Hapa 800 BrailleJet is a full-digital UV inkjet system printing Braille dots onto pre-printed flat or erected cartons. A solvent-free Drop On Demand technology, the BrailleJet uses a UV-curing high-viscosity ink, which makes it ideally suited for use within a pharmaceutical environment. Two lines are printed simultaneously per head, and it is possible to add additional heads to increase print width. Quickly printed and dried, the raised dots do not compromise existing printed text or graphics, as no embossing is involved, and offer optimum readability, while increasing line flexibility and line uptimes. Boost production flexibility and machine running time by printing to order the exact number of cartons required. An easy to use, GMP compliant in-house printer, the BrailleJet offers an optimal, cost-saving solution for the pharma and healthcare industries. Compact and robust, EasyFlex has been developed out of proven Hapa UV Flexo technology. 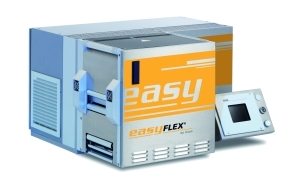 Easily installed on virtually every brand of packaging machine, EasyFlex uses format-free rotary printing technology compatible with both intermittent and continuous motion machines. Using laser-engraved Rubberflex or photopolymer print mats, EasyFlex produces high-quality graphics and text on a variety of blister foil materials. Quality and accuracy of print is ensured by the print mat pin location system and exchange of artwork or colours is made without the need for tools or cleandown, all of which contribute to fast changeovers and less downtime. 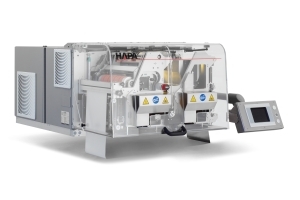 Hapa’s ready-made DigiMATIC is a fully digital piezo inkjet printer designed to print on a wide range of roll-fed substrates including aluminium foil. Paper, PVC and Tyvek. 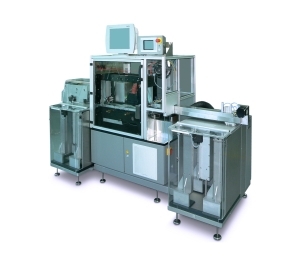 Designed for use within a pharmaceutical environment, this Drop On Demand technology is compact and robust, uses modern, solvent-free UV curing inks, and can be installed on top of any intermittent packaging machine. 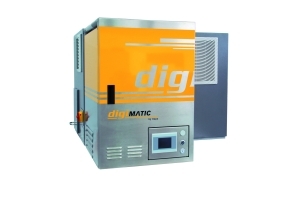 The DigiMATIC is ideally suited for inline printing of any sized batches, unit dose coding as well as serialization, and marking. Benefit from low start-up costs, greater packaging line flexibility and productivity as well as improved Overall Equipment Effectiveness. The RedCube, Hapa’s latest UV DOD Inkjet printer for High-End Marking, is redefining the word compact. 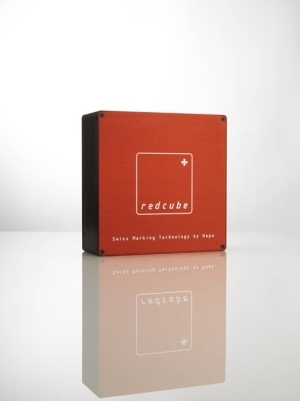 About the size of a TetraPac®, the RedCube can be supplied in an open number of configurations tailored to meet the conditions of any given production process. The RedCube prints a standard 36mm width using proven and reliable Hapa DOD-Technology. It is easy to integrate on any transport system with continuous and homogeneous inelastic motion and is available using UV-curing inks. Codes, texts and graphics printed in a single pass meet pharmaceutical-quality print standards on any kind of substrate, lacquered or unlacquered, and without the need to pre-condition surfaces. Thanks to the RedCube, Marking and Barcode printing as well as Track & Trace, Serialization and other Anti-Counterfeiting measures, such as those required by the French Health Products Safety Agency (CIP13) and Turkish MoH medicinal products tracking regulations, are easily realized.